Love the curtains here...what a great way to make store bought panels look custom. Even though if this was my dining room I would make them longer, just "kissing" the floor, but I wont hold it against them. Janell just pointed out to me that they do hit the ground...in that case this room is perfect! Thanks Janell!! 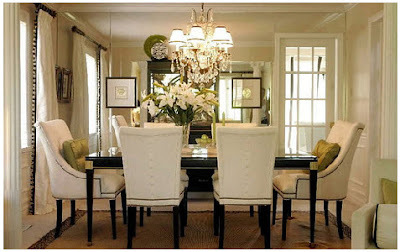 I love the dining room chairs! I wonder why they chose that length? Seems a little strange. But otherwise I LOVE the look. Maybe 64" panels were on clearance for $1.00?? If they are short I also think it looks odd, but I clicked on the image for a closer look to see why they made this choice and it appears to me they do hit the floor. It's difficult to determine based on the fact that the floor color blends right into the drapery color. I love this idea, it certainly is a way to make 'ready to wear' look custom! Yep - it's a weird visual trick, but they do appear to touch the ground. Beautiful room. You are welcome, it is a weird visual trick, thanks for not taking offense!! I'm seriously considering doing something like that for our living room. I hate the curtains I bought from Target and want to start fresh. I'm thinking of customizing Ikea back-tab panels with either a wide trim or fabric wrapped around the sides. It is a strange optical illusion, for sure. I looked at the photo about three times before I could tell that they do touch the floor! What a great look; love that tip!